MONTREAL — Brendan Gallagher scored twice and added an assist to lead the Canadiens to a 7-4 victory over the Buffalo Sabres on Saturday night, extending Montreal’s win streak to three games. Artturi Lehkonen, Andrew Shaw, Paul Byron, Max Domi and Tomas Tatar, into the empty net, also scored for the Canadiens (40-28-7), who have produced 14 goals on their current win streak. Domi and Tatar also had two assists each. Making his seventh start in a row, goalie Carey Price made 23 saves on 27 shots. Sam Reinhart, Alexander Nylander, Marco Scandella and Jack Eichel scored for the Sabres (31-34-9), who were officially eliminated from playoff contention. Carter Hutton stopped 37-of-43 shots. Montreal increased its lead to three points over the idle Columbus Blue Jackets for the second wild-card spot in the Eastern Conference. Columbus has a game in hand. The Canadiens remain two points behind the Carolina Hurricanes for the first wild-card spot. The Hurricanes, who have a game in hand on Montreal, beat Minnesota 5-1 on Saturday night. Montreal plays Carolina on Sunday. With the game tied at 3-3 in the second period, Byron gave Montreal the lead at 18:03 on a 2-on-1 with Jordan Weal, whose shot was saved by Hutton before bouncing off Byron’s skate and in. Gallagher made it 5-3 at 8:35 of the third period for his 33rd goal of the season before Eichel got one back for the Sabres at 13:13. Domi sealed it with a power-play goal with 4:30 remaining in the encounter. Tatar, playing his 500th NHL game, scored an empty-netter with 2:13 to go. The Sabres have one win in their past 10 games (1-8-1). Reinhart got the high-scoring affair going when he went five-hole on Price at 12:26 of the first period. The teams combined for six goals in a back-and-forth second. Montreal tied it up 5:09 into the middle frame when Lehkonen took a feed from Shaw and scored while crashing into the net. Lehkonen only had one point in his previous 22 games. Domi earned his 200th NHL point on the goal with a stylish spin-o-rama pass to Shaw. Alone in the slot, Gallagher gave the Canadiens their first lead of the night at 9:12 after a remarkable one-handed pass from a sprawled-out Phillip Danault behind the net — a career-high 32nd goal this season for Gallagher. The home team went up 3-1 when Shaw took a saucer pass from Domi and beat Hutton blocker side with a wrist shot at 14:23. The Sabres responded instantly, scoring 30 seconds later through Nylander’s power-play marker to make it 3-2. A turnover by Jonathan Drouin led to Scandella’s equalizer on a fast break at 16:08 on Buffalo’s 14th shot of the game. 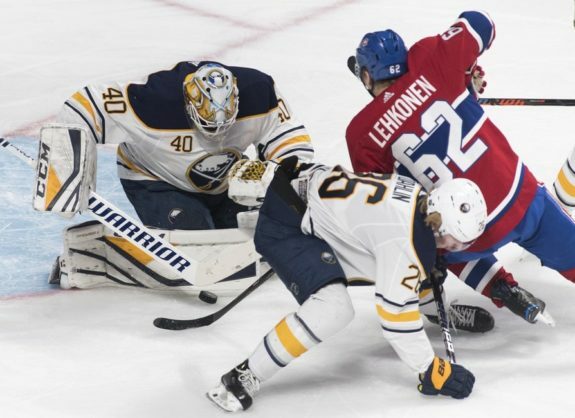 The Sabres failed to complete the season sweep after winning the first three games against the Canadiens this year. Notes: Jason Pominville was back in the Sabres lineup after being a healthy scratch the last two games.